Do it yourself Weekly Dorm Room Calendar. 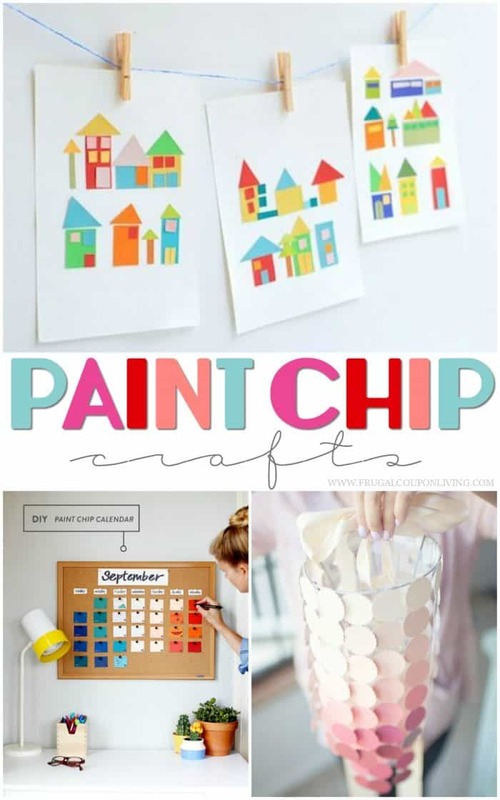 This easy Paint Chip Craft can be done in a matter of minutes and aids in organizing daily home and school life. As a former teacher and a mom of pre-teens, one of my favorite posts on Frugal Coupon Living was Dorm Room Hacks and Tips. I loved putting together ideas for the dorm room without having to send one of my girls off to school. I also loved the college organizing ideas that could easily be transformed into Teen Bedroom Ideas. As any mom knows, keeping teens organized can be a huge challenge, particularly when they go off to college! College kids need all the help they can get when organizing their dorm rooms. Most dorms are tiny spaces with barely any room to move- much less space for organizing supplies! 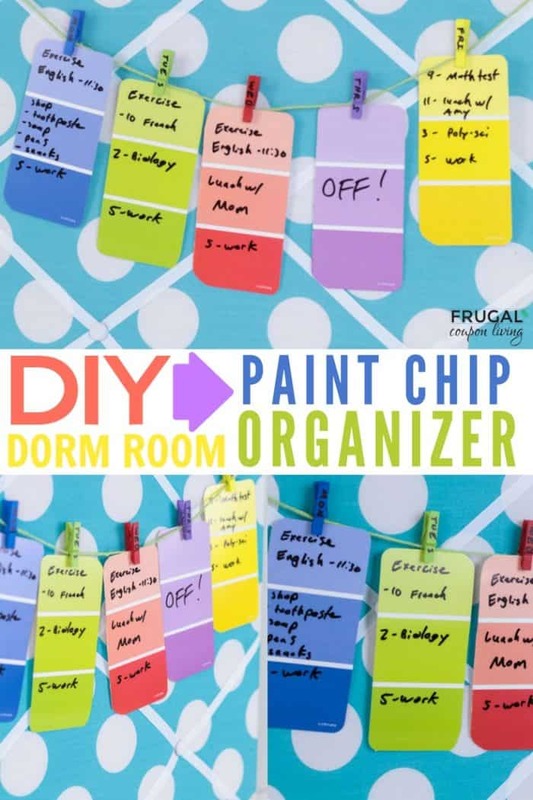 With this cute paint chip dorm room organizer calendar, kids will be prepared to face whatever college has to throw at them. This craft was easy. It took some of our preexisting Paint Chips and turned them into a weekly calendar for college. Younger kids will also love this cute paint chip calendar, and after you make the first one, you just might have to make one for everyone in the family! This calendar can be placed in a home bedroom, a home command center, and maybe even inside a teen locker for school. Wherever you place your calendar, this is a super inexpensive way to stay organized, and it doubles as cute wall art at the same time! Cut the paint chips to the desired size. I rounded the corners on my paint chips to give them a softer appearance. 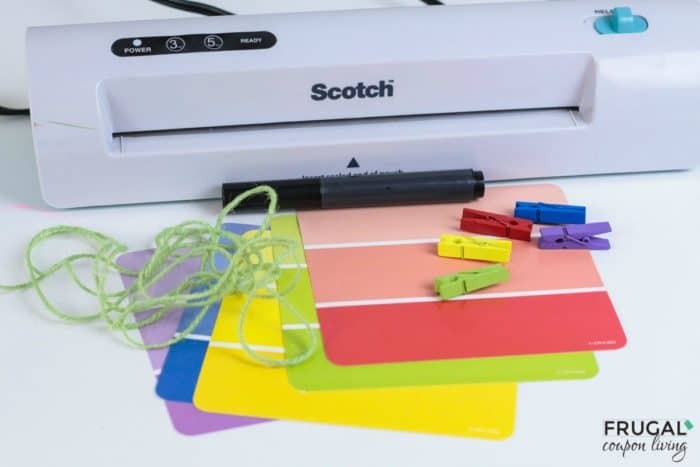 Place the paint chips into a laminating pocket and run through the laminating machine. Cut the paint chips out of the plastic. 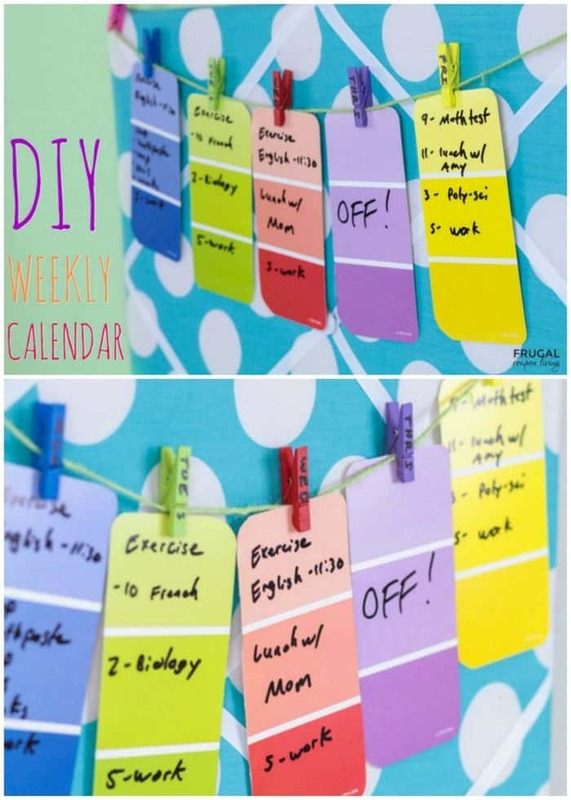 Use a permanent marker to write the days of the week onto the clothespins. If your clothespins are small, use abbreviations for the days of the week. Decide if you want a 7-day or 5-day calendar. 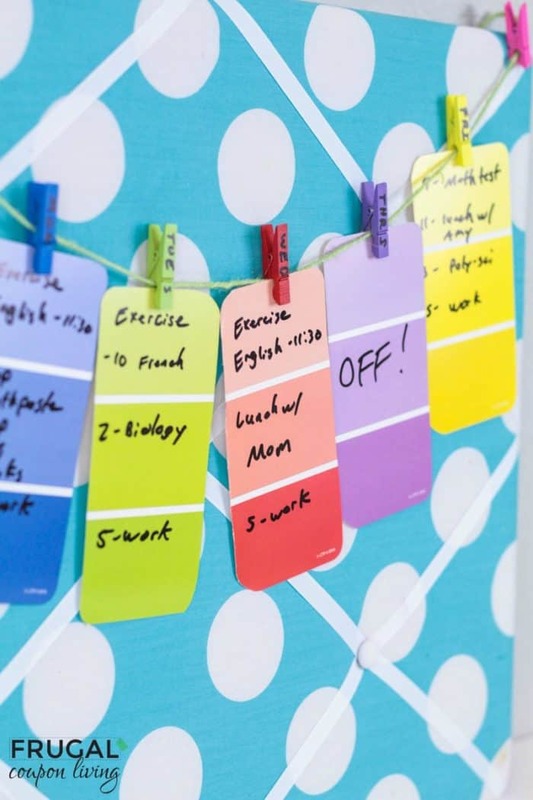 Use a dry erase marker to write the daily tasks onto the paint chips. If your to-do list gets too long, add another paint chip to that day. Hang the twine string somewhere in a dorm room or on a bulletin board. Use clothespins to secure the paint chips to the string in daily order. As you complete each task, wipe it off the paint chip. The next week, you can reuse each paint chip to write that day’s tasks. We found some other helpful ideas for college life. Take a look at these Dorm Room Hacks and Tips. Pin to Pinterest. Have extra paint chips? Take a look at these Paint Chip Crafts. Add to Pinterest on your Craft Board. Organize yourself with these Home Command Centers (and Homework Center Ideas) – also great for college life! Pin to Pinterest on your Home and School Boards.